Stoke City manager Mark Hughes leapt to the defence of Victor Moses after he was accused of diving in Sunday’s 2-1 win over Swansea City. Having fallen behind to a Wilfried Bony’s penalty, Hughes’ men were handed a reprieve when referee Michael Oliver pointed to the spot after Moses was brought down by the slightest of touches from Angel Rangel. Swansea boss Garry Monk labelled the decision “disgusting” after the game, which was eventually settled by substitute Jonathan Walters’ strike, with the 35-year old also accusing Moses of diving. However, Hughes insisted the referee had made the correct call, suggesting Monk’s criticism was a sign of his inexperience as a manager. “Sometimes it’s emotional after games, especially when you’ve lost a game that you were leading,” the Welshman said. “There’s a 20-minute window where the Sky cameras want their bit of flesh and sometimes you have to bite your tongue and be careful what you say because you can get into trouble. Despite admitting the penalty decision was “soft”, Hughes was adamant that Moses did not dive. He added: “I think he was running at pace in between two defenders and I think the onus is on the defender not to go anywhere near him. “If you look at the angle I’ve seen, which I think was the angle that the referee saw, there’s a definite movement from Rangel’s arm to go across Victor to knock him of his stride, so in my view that’s trying to impede him. “If you do that in the box when someone’s running at pace, you’re in danger of conceding a penalty. 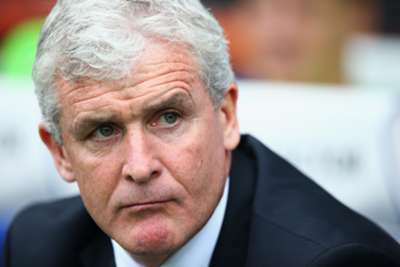 The result represented Stoke’s second consecutive win at home, with Hughes now left to prepare for a tricky trip to Southampton, who will be full of confidence after an 8-0 mauling of Sunderland on Saturday.